Three different sauces, three different preparations - this chicken recipe gives you a whole bunch of options. Now you don't have an excuse for serving up plain old grilled chicken! 1/2 cup KRAFT CATALINA Dressing, a few spoonfuls of Soya Sauce and a spoonful of ginger. 1/2 cup MIRACLE WHIP Dressing, a few spoonfuls of orange juice and a spoonful of thyme. 1/2 cup KRAFT Regular Barbecue Sauce, 1/4 cup crushed pineapple and a clove of crushed garlic. KABOBS: Thread chicken pieces on skewers, alternately with your favourite fruit and veggie chunks. Grill, brushing with sauce until chicken is cooked through and veggies are tender. Serve over rice. CHICKEN BURGERS: Barbecue chicken, brushing with sauce until cooked through. 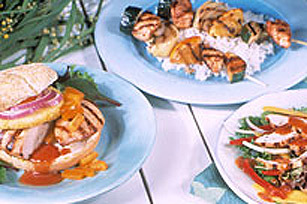 Place cooked chicken on bun and garnish with sliced fruit and veggies. Serve with sauce on the side. FOR SALAD: Barbecue chicken, brushing with sauce until cooked through. Slice chicken and place on mixed greens. Add sliced fruit and veggies and drizzle with sauce.